A Florida judge on Monday threw out federal antitrust and boycott allegations brought by 26 Mississippi collision repairers against some of the largest auto insurers in the country. The Sherman Antitrust Act claims were dismissed with prejudice, which means there’s no chance they can be refiled, only appealed. 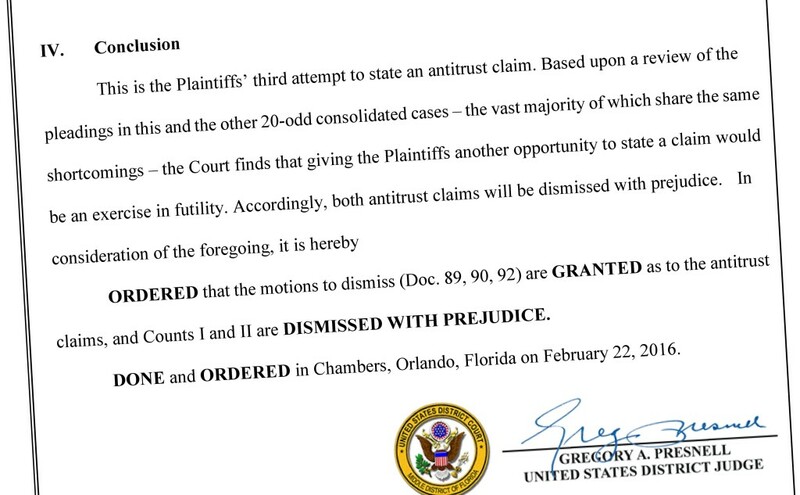 However, Middle District of Florida Judge Gregory Presnell hasn’t yet ruled on the other claims in the lawsuit — including a potentially stronger steering case (legally known as “tortious interference”). U.S. Magistrate Judge Thomas Smith last week recommended three shops’ allegations of tortious interference– two against Progressive and one against State Farm — had enough evidence to survive a motion to dismiss. The incomplete dismissal might for now be a ray of hope for shops in Mississippi and more than a dozen other states whose cases were placed before the judge. It’s certainly a better near-term outcome than the fate of the related A&E v. 21st Century, a Florida case Presnell threw out for good in a single September 2015 ruling. That case, the Mississippi Capitol Body Shop et al v. State Farm et al, and many of the others were prepared by Jackson, Miss.-based Eaves Law Firm. As noted above, there’s also the possibility the shops could appeal. Though the Florida shops haven’t yet done so, others at an earlier stage of their cases have asked the Eleventh Circuit Court of Appeals to intervene. Eaves said the shops would appeal Presnell’s ruling and that in the A&E case as well. Still, the ruling Monday doesn’t look good for many of the other 20-plus cases with similar antitrust arguments. The 26 Mississippi shops in Capitol couldn’t overcome a tough antitrust hurdle: Are similar actions by similar businesses collusion or merely just smart competition? “The actions allegedly taken by the Defendants in this case, such as paying the same labor rates, refusing to pay for the same list of procedures, and requiring the use of lower-quality parts, are not enough, on their own, to constitute a violation of Section 1 of the Sherman Act,” Presnell wrote Monday. The shops had to prove either that everyone named as a defendant acted against its self-interest or behaved in a way to suggest another “plus factor,” according to Presnell. In this case, the repairers had alleged that an insurer couldn’t underpay shops, refuse to pay for operations truly needed for a “pre-accident condition” repair and mandate non-OEM parts unless it was secure that the other insurers would follow suit. Otherwise, the shops argued, it’d quickly lose customers to those who paid shops to do a better job. A desire to make more money (by spending less on repairs) can’t count either as a “plus factor,” Presnell ruled. “If the existence of a profit motive was enough to make it plausible that the defendants had colluded to fix prices, then essentially every alleged price-fixing agreement would survive a motion to dismiss,” he wrote. Shops had pointed out that State Farm, the No. 1 auto insurer in the country, conducts allegedly flawed market surveys to determine what it’ll pay. Once it changes its rates, the other insurers allegedly quickly follow suit. For example, State Farm bumped its labor rate ceiling $2 to $44/hour, and Shelter and USAA did the same weeks later. After it upped them again to $46 in 2012, seven other insurers, including Shelter, USAA and State Farm’s closest competitors Allstate and GEICO did too. Apparently, Presnell didn’t notice a double standard here. “Defendants have threatened Plaintiff shops and others that if they discuss labor rates with each other, they will be price fixing and breaking the law. Statements to this effect have been made by Defendants State Farm, GEICO, Progressive and Allstate specifically but not limited to Plaintiffs Capitol, Clinton, Bill Fowler’s, Smith Brothers and Bolden,” the shops wrote. As for the federal boycott claim, he argued there wasn’t any evidence that any of the insurers had flat-out refused to do business with a particular shop. 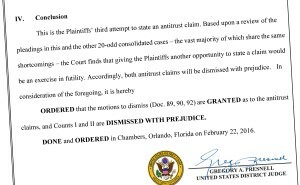 “At best, the Defendants argue, the Plaintiffs have included in the Second Amended Complaint some allegations of a particular insurer attempting to steer its insured from a shop operated by one of the Plaintiffs to a different shop that had a relationship with the insurer,” Presnell wrote.